GM Evgeny Bareev gave a long and outspoken interview to Maria Fominykh for Chesspro. Highlights included his description of why Jan Nepomniachtchi was excluded from his chess school, and how Carlsen is following in Kasparov’s footsteps. The interview has a lot about the new generation of chess players. Bareev spent a month and a half in Vietnam working with the “Vietnamese Carlsen” Le Quang Liem. And then there’s Jan Nepomniachtchi… who trained at the Bareev chess school but was expelled for his behaviour and especially for throwing a shoe at a trainer (though Jan defends himself by saying it’s not much of a school – just daily studies you could get from a book – and that there was a more than respectful distance between the trainer and the trajectory of the shoe!). As a result the school decided only to teach younger children. Bareev says that in the Russian Cup Nepomniachtchi demanded that the chief arbiter gave him the point when Bareev went to the toilet between their two blitz games. He says that Jan could could be accepted into the Danailov team – “he’s passed the toilet test”. He also comments on Carlsen trying to take moves back (the interview was after the second day of the Tal blitz – Carlsen stopped doing it), and explains it by the fact that Carlsen’s now working with Kasparov and thinks he can conduct himself “as a champion” (he says that Kasparov once said that if you only just let go of a piece then it doesn’t count – or at least not for him). 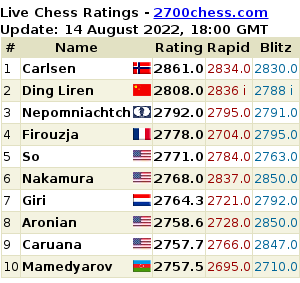 On prospects for becoming world champion – he can see Karjakin in the top 10 but as long as Carlsen’s healthy doesn’t rate his chances (and the taking moves back proves how strong Carlsen’s motivation is). Of those born in Russia there’s Sjugirov and “the shoe-thrower”. There’s also lots on the trials and tribulations of a middle-aged no-longer-quite chess professional.